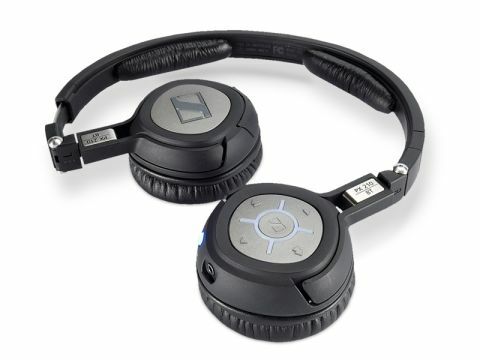 We've seen Bluetooth audio stuff before, but nothing that works as well, sounds as good, or makes us slap our credit card down with quite as much enthusiasm as the PX 210 BT Bluetooth headphones from Sennheiser. They use the A2DP protocol to deliver proper stereo sound. We tested them with an iPhone 3GS and a Bluetooth-equipped MacBook Pro running Mac OS X 10.6, and they paired and worked without a hitch, devoid of even a single dongle. We were astonished to find that audio streamed from the iPhone was clean and free from interference or noticeable compression. Seriously: it sounds good, and this is unusual with Bluetooth audio devices. Results from the MacBook Pro were less pleasing, with some compression artefacts especially noticeable in vocals. Unlike the iPhone, however, the controls mounted on the right cup can skip tracks forward and back on the Mac. The iPhone's as-yet incomplete implementation of the AVRCP protocol means only the volume controls on the headphones work here. They're light and comfortable, even when worn with glasses. The drivers produce good sound; restrained for some, perhaps, but very pleasant. Connect with a cable to save battery life; the latter offers between nine and 10 hours' playback. The removable battery pack charges via micro-USB.